Many times in the past, at work in Toronto, Chicago, Orlando, or Boston, I’d hear about spring equinox (night and day of approximately equal length) and begin to wonder how conditions were at our Muskoka cottage. 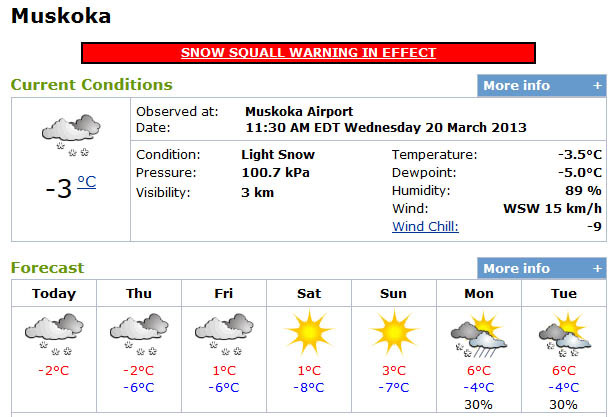 In case you are at work planning for spring at the cottage, I have an update for you. Depending on where you are, it may not be all that spring-like, and it isn’t here either. On Lake Muskoka, I made this image less than 20 minutes after the spring equinox today (Mar 20th). It’s hard to tell, but it was snowing and the high today is expected to be -2C. Lake Muskoka from Muskoka Beach area. Mar 20, 2013, spring less than an hour old. If you are reading this a bit later here’s the current forecast. And have a look below at the historic records for this date. Last year we hit 24.8C – much better than -18 in 2007! We did have an “early” spring last year and cottage real estate, just took off for us. Speaking of spring, we’re at the Cottage Life show on April 5th -7th, really getting the cottage season jump-started; actually we are there Sunday the 5th from 1-5pm, so come and say hello. If you want tickets give us a call.